In the week and a half that I’ve been blogging, I’ve really enjoyed it more than I expected… But I’ve also learned that it’s a lot more behind-the-scenes work than I expected. This lovely book has been a godsend. Written by Joy Cho of Oh Joy!, it is simple (thank goodness), easy on the eyes and full of great advice for a newbie like me. 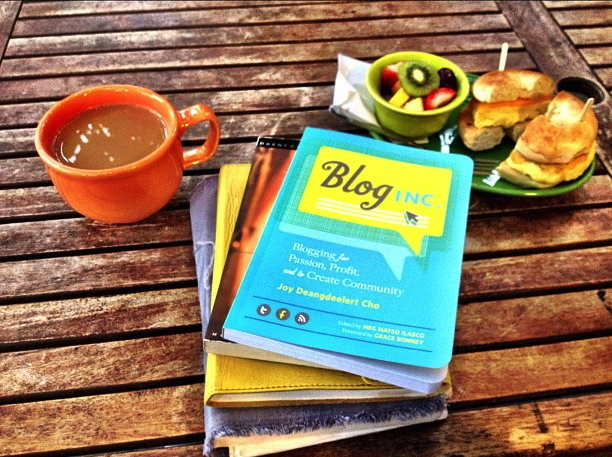 I highly recommend it for all you bloggers (novice or otherwise) out there! I bought my copy here. oh my gosh your breakfast! yummmmm. I can’t wait for you to write a guest post, missy! I’m Kathryn, a part-time writer and full-time mother. Thanks for visiting!